MODULAR HOME BUILDER: Basements - What Young Home Buyers Want - Who Knew? Basements - What Young Home Buyers Want - Who Knew? With housing market ticking up and signs of life in home renovation and remodeling, there is one under the radar area of the home that seems poised for takeoff — the basement. Superior Walls of America, manufacturer of precast foundation systems, has seen a 20 percent increase in sales over the same time period in 2012. 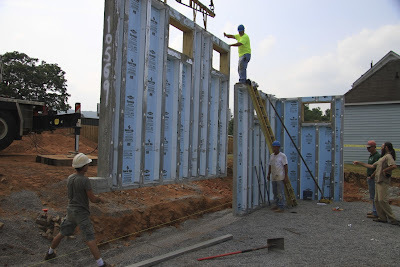 “Our business definitely began increasing once new construction started back on a positive track,” says Jim Costello, president of Superior Walls. “Just for the month of May this year we hit sales numbers that we have not seen for any month since October of 2008." That’s a great indicator that we’re in for a solid, growth-oriented 2013.” What’s driving those sales numbers for Superior is that more and more young home buyers are building homes with basements. A study by the National Association of Home Builders, “What Home Buyers Really Want,” showed that 76 percent of Gen Y and 74 percent of Gen X respondents wanted a home with a basement. “Younger home buyers, who are investing in new construction homes, are looking for added living space and easily-accessible storage areas in the homes they purchase,” Costello adds.